Orchids should be repotted before the growing medium starts to break down. Be conservative in choosing the size of your pot. Orchids thrive in pots matched to their overall size. Small orchid plants need pots 2.5"- 5" in diameter; medium plants need pots 6"-8" in diameter and large orchids should be put in pots 9"-12" in diameter. Don't forget to soak bark mulch overnight before potting orchid in wet pot. Suggestions: try a Tuscan pot with your orchid. This pot is designed with orchids in mind but may be suitable for many other plants. It is available in white, red or black clay. The pot is designed to work partly as a pedestal which raises and displays the orchid. The foot of the pot is raised and cut out to lift the pot out of the water on the saucer and help aerate the roots. There are many types of orchids but primarily the Phalaenopsis or "moth orchid" (Gk. Phalaina-moth opis-appearance) , Cymbidium or Oncidiums work well in these pots. Try a white Phalaenopsis in a white orchid pot. These slits are for extra aeration of the roots and drainage required by some orchids. The slits are custom ordered at a $2 charge. 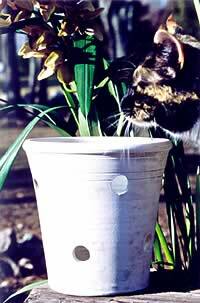 Example of Universal Orchid Pot with white and black clay. These pots were specifically designed for the Paphiopedilum orchid by Kim and orchid specialist Mariko Kawaguchi of Donaromas Nursery on Martha's Vineyard. Paphiopedilum or lady's- slipper orchid (Gk pedilon - slipper) have a narrow deep root system and require constant moisture. Therefore, the pot is narrow and deep made out of a black clay which is less porous than terra cotta so that the orchid does not dry out as fast. The rich dark color of the black clay pot compliments the ruset browns, greens and burgundy colors of the "Paphs". 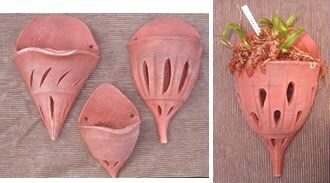 These unique pots are designed for orchids that require free drainage and aeration. 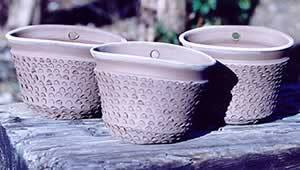 Made in terra cotta clay they come in small or large sizes and each pot is one of a kind. 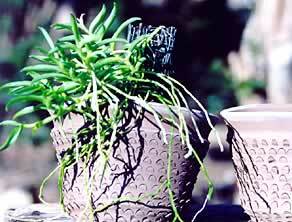 Hang these these pots in your greenhouse or home and increase your orchid growing space. Orchids require alot of moisture. One way to help your orchid get more moisture in a dry winter house is to put it on a pebble tray. This is a ceramic dish, glazed on the inside with either clay pellets or gravel in it. You can cluster several plants in a grouping or place one large plant on it. Clay Trout Pottery offers pebble trays in black, white and red clays. The dimensions are 12 inches inside and the trays are $45 dollars each. Mount the root system of your miniature orchid to the textured outside of this unique pot, fill with water and hang. The water will slowly wick though the wall of the pot and keep your orchids roots hydrated and cool! This attractive pot is ideal for orchids like Cattleyas that like extra aeration around their roots. These plants also like to dry out in between watering and this pot provides just the right environment for them. Pots available in white, black or terracotta clays. This elegant pot can be planted up or used as a cachepot for your blooming orchid. The sculpted motif applied to the pot is of a Phaphiopedilum or "Lady Slipper" Orchid. 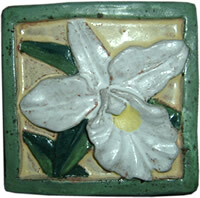 Clay Trout Pottery now offers an assortment of carved, hand glazed orchid tiles. Each tile has a wire loop embedded in the back so that it can be hung individually. These tiles make both wonderful decorative accents and gifts. Click here to view our varied selection. Other Examples of Potted Orchids. Pedestal Urn with sculpted Cymbidium orchids and carved leaves around base.